Analogue Productions' RCA Living Stereo Reissue Series No. 2, with 25 newly remastered mainstay classical albums, will delight and astound your ears with their clarity and warm, rich tone. As with our first highly-regarded LSC series, shortcomings of previous editions have been improved upon - from the mastering, to the LP pressing, to the sharp-looking glossy heavyweight Stoughton Printing tip-on jackets that faithfully duplicate the original artwork, "Living Stereo" logo, "Shaded Dog" label and all! Mastered by Ryan K. Smith at Sterling Sound from the original 3-track master tapes, cut at 33 1/3, and plated and pressed at Quality Record Pressings - makers of the world's finest-sounding vinyl LPs, - no other editions match these for the quietest 200-gram platters available. Polish-born violinist Henryk Szeryng was probably the finest product of Carl Flesch's legendary teaching career (other luminaries to emerge from his studio in the years between the two World Wars include Ivry Gitlis and Ida Haendel). 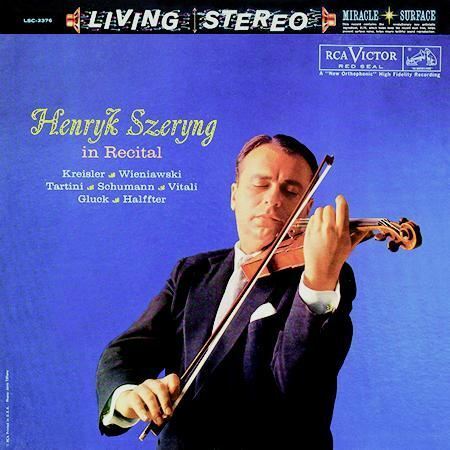 Possessing an iron technique and a musical intellect of rare insight, Szeryng established himself as one of the pre-eminent concert violinists of the post-World War II decades.